A New Jersey Court recently ruled that a volunteer Fire Company is subject to the state’s Open Public Records Act. In Justin D. Lamb v. Lavallette Volunteer Fire Company, No. 1, et al., the court held that in the absence of a designated record custodian, it was appropriate for the requestor to serve the Borough of Lavallette’s clerk. Plaintiff Justin D. Lamb is a volunteer firefighter and a member of the Lavallette Volunteer Fire Company No. 1 (Fire Company). On August 25, 2016, he submitted a written OPRA request to the Fire Company, as well as the Borough of Lavallette and the New Jersey State Firemen’s Association (NJSFA). Plaintiff requested copies of (1) all Lavallette Volunteer Fire Company applications for membership to be an active member, with appropriate redactions, from 2004 to 2016; (2) all training records of the Fire Company; and (3) all financial records and expenses for the Fire Company’s attendance at the annual NJSFA convention in Wildwood, NJ. The Fire Company failed to respond to the OPRA request, and Lamb filed suit. The Lavallette Volunteer Fire Company No. 1 is a New Jersey non-profit corporation. At the time the complaint was filed, Defendant William Reed served as the President of the Fire Company. Plaintiff asserted that Defendant Reed at the time of his OPRA submission was the “custodian of a government record” as defined by OPRA. Meanwhile, Reed maintained he neither held any public office nor been designated the “records custodian” for any public agency. Reed further claimed that in his function as President of the Fire Company he does not have access to records. Rather, the operational by-laws of the Fire Company designated the Secretary as the officer who is designated to maintain documents relating to the business of the Fire Company and the corporate seal. The Court finds that in default of that action, then an OPRA records request served upon the municipal clerk is deemed constructive notice to the volunteer Fire Company. The municipal clerk is the only records custodian for all agencies and instrumentalities of the Borough of Lavallette. The OPRA request was directed to the Municipal Clerk who shall be primarily responsible for responding to that request. Because Lamb was the prevailing party, the court also ruled that he was entitled to reimbursement of his attorney’s fees. However, Judge Ford determined that the borough, rather than the Fire Company, should be responsible for the fees. 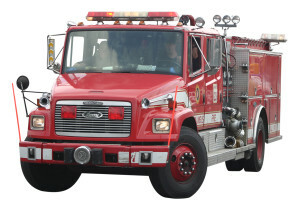 “The Court agrees, however, that the volunteer members of the Fire Company, to the extent that they are performing a vital governmental service, may not be held personally liable for counsel fees,” she wrote.